Three authors come together to bring stories of love and knitting: Debbie Macomber tells the tale of a girl and her mom and their special list of twenty wishes, but what about Ellen's desire for The Twenty-First Wish? Coming Unraveled by Susan Mallery has one young woman's dreams of Broadway dashed and her return home is marred by a mistrustful friend of her grandmother. In Return to Summer Island, Christina Skye shows how one woman that while a horrible accident may have taken away one piece of her, she can draw another path for herself, in life and in love. Knitting! Stories about knitting and knitters! Okay, got that out of the way..
Debbie Macomber brings us back to Blossom Street in The Twenty-First Wish to meet Anne-Marie as she and her adopted daughter, Ellen, prepare to move from their small apartment to a new house. Anne-Marie and Ellen each prepared a list of twenty wishes over the past year, which included learning how to knit and finding a new home. Along the way Ellen's birth father, Tim, had come back into their lives. Tim spurned Anne-Marie once, but Ellen has a twenty-first wish - for her mom and dad to get together. With another suitor in Anne-Marie's life, can a second chance actually be forthcoming? I have read a couple of Macomber's Blossom Street books and enjoyed them. The alternating viewpoints of Anne-Marie, Ellen and Tim cycle through the chapters, revealing their thoughts about what transpires. The tone of the story is light, and even the harder subjects of Ellen's adoption, Tim's alcohol recovery and discovering he has a daughter are strung together softly through the novella. Maybe a full-length novel would have given more depth to the relationship. All in all it is a sweet story about a little girl's desire for her parents to be together. Susan Mallery presents Robyn Mulligan in Coming Unraveled, which is exactly what Robyn's life has done. Her attempts to be an actress have failed, and broke, exhausted Robyn comes home to Texas, her grandmother and the knitting store she always felt comfortable in. However, TJ Passman thinks Robyn is coming to sponge off her grandmother, and he makes it pretty clear he will not allow Robyn to take advantage of her. Can Robyn prove to TJ she is looking to help and not be a burden? Will TJ's past tragedy allow him to see the connection that he and Robyn have to each other? This storyline seemed a bit more solid than the other two stories. I like a little grittiness between characters to start, although judgmental men have a little to be desired (but desired they are in romances!). Everyone had a bit more substance, including the secondary characters such as Robyn's grandmother and her friends at the knitting store. Unconditional love shows through between Robyn and her grandmother also, when Robyn finally admits her real reason for coming home. It is obvious that TJ's hard-headedness about Robyn stems from his past and his work, but still makes a girl want to smack him with a rolled-up newspaper. That is part of the fun in romances. In Return to Summer Island, Christina Skye brings us Caro McNeal, who has gone back to her childhood place on Summer Island after a car accident has left her wounded physically and mentally. A chance encounter at her grandmother's home with a Marine preparing to ship off to Afghanistan makes Caro realize that she can find a way through to heal both her body and her heart. Emails back and forth show the growing bond between them, but will a violent act once again disrupt Caro's chance at feeling whole? Skye attempts to bring a deep introspection with the character of Caro. Caro's sense of peace and expression in her knitting is gone after her accident, and she fears that she will never heal. Back with her grandmother on Summer Island, she discovers that art has always been a part of her life, and finds new ways to bring it back. The whole relationship between Caro and Gage was a bit forced in a fast storyline. A chance meeting to pick up a painting results in a lunch date and Gage on a plane overseas within several hours? Maybe? However, the thread of Caro's grandmother, the island vet and the animals were sweet enough to keep the incredulous feeling I had towards the romance at bay. The Knitting Diaries shows how knitting is many things to many people. Knitting can comfort, inspire passion, or just be so ingrained it is a part of life. 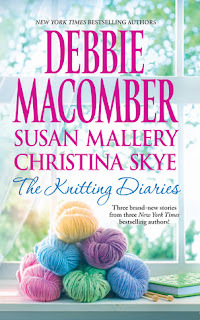 A cozy set of novellas with knitting patterns included, these sweet, if not always believable, romances can be enjoyed by fans of the authors or of knitting, myself included.